Two of the most powerful storms that ever made landfall are Typhoon Yolanda (international name: Haiyan) which hit the Philippines and Hurricane Patricia which hit Mexico just yesterday. But why the confusing terminology: hurricane and typhoon? Hurricanes are storms that frequently form in the warm waters of the Gulf of Mexico, the Caribbean Sea and the tropical Atlantic Ocean as far east as the Cape Verde Islands. A typhoon is an extremely large, powerful and destructive storm that occurs in the region of the Philippines or the China Sea. Hurricanes and typhoons are all the same weather phenomenon although we use different names for these storms depending on their place of origin. In the Atlantic and Northeast Pacific, the term “hurricane” is used. The same type of weather disturbance in the Northwest Pacific is called a “typhoon”. Another disturbance, a “cyclone” occurs in the South Pacific and Indian Ocean. 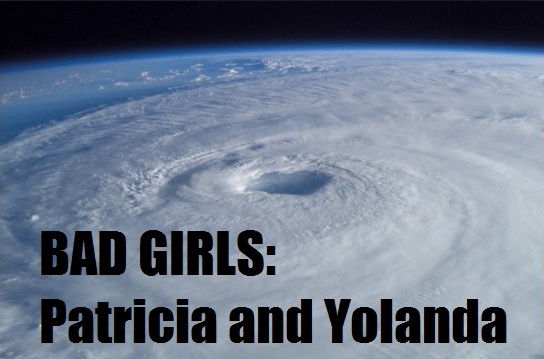 These “bad girls”, Yolanda and Patricia, can be considered as the drum-beaters for worsening weather conditions in the light of global warming and climate change. Mankind must heed their warnings and resolve to dramatically bring down fossil fuel emission which is the principal reason for global warming and climate change. Otherwise, as expects are now predicting, we should expect more of these bad girls: Patricia and Yolanda.